After watching Godzilla vs King Ghidorah at the Monster Mania Film Festival last night, it struck me how much cultural value the series embodies about the hopes and fears of Japan. So I asked myself, if I could resurrect a monster to save Singapore, what would it be? The Merlion, of course. A monster of our government’s creation to attract the tourism dollar, it has over time become an icon that is part of our collective memory. Some people love it, some people hate it, but you have to admit, it is Singapore — a government project to attract money. So we’ve got the hero, now we need a villain. What would Singapore need to be saved from? Since King Ghidorah had three heads, my first thought was the three towers of the integrated resort that I dub King Integrated Resort (IR)! Plus, it helps that they are physically located to face-off one another. Now I know both the Merlion and the IR are meant to be tourist traps, so let’s add a layer of perennial Singapore debate here. 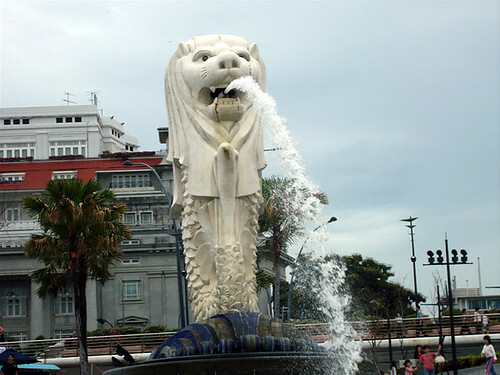 The Merlion is a tourist attraction of yesteryear and stands for using our culture as an attraction. King IR on the other hand is a massive international conglomerate here to use vice, glitz and glamour to attract tourists. And there you have it, the epic Singapore battle! Threatened by King IR, Singaporeans reluctantly resurrect the Merlion and rally behind it! Totally unrelated trivia, there is a IT company in Russia that named itself after the Merlion!